Observed at Kakamega Forest, Kenya, November 2010. The bee is almost 1 cm long. 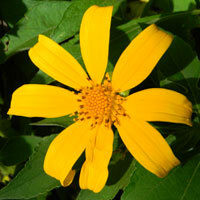 It is on a flowering head of Mexican Sunflower (Tithoniaa diversifolia). The smooth yellow hemispheres in the top left corner of the photo are unopened florets, in the bottom half are opened florets with their stigmas exserted. The bee is following the boundary between the two groups of florets that are just opening and have pollen-bearing stamens exserted. Identification provided by Dino Martins. Tithonia is a non-native sunflower originally from the the Neotropics. That this bee is able to collect and process this pollen suggests that it is a a generalist species. Many bees are much more specific in their flower choices and must use very specific, native species. Invasive, non-native plants like Mexican Sunflower are a threat to bee and pollinator species diversity. 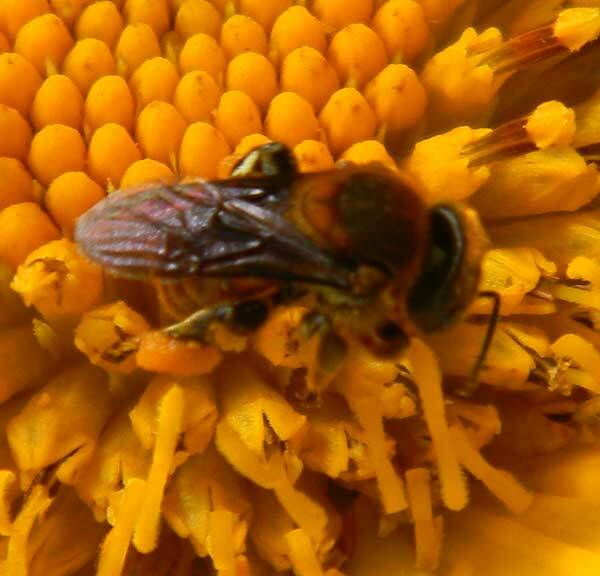 As this bee scrapes its body over the surface of the flower, pollen grains adhere to the specialized setae (hairs). When the bee returns to its nest the pollen is then scraped off and formed into food packets for the developing bee grubs. Copyright Michael J. Plagens, page created 31 December 2012.